How is buying a foreclosure different? Monty’s Answer: Hello Bridgette. There are three ways one participates in the foreclosure market. Each one of them possesses different characteristics. In my opinion, the most fundamental characteristic is whom you are dealing with. • Real Estate Owned (REO) – The lender has title to the property. You are dealing directly with the owner. In most cases, they know the market and can make decisions independently. The lender may still have to deal with private mortgage insurance (PMI) companies or the federal government, but they are a motivated seller. • Short Sales – The homeowner has title to the property so you are dealing with them. They are delinquent on their mortgage payments because the loan is greater than the home’s value. Short sales require a number of competing interests to sign off on your offering price. This process can be long and difficult. They each want to minimize their exposure on the loss. This group is motivated as well. • Auction – The proverbial “courthouse steps” sale. Here, you are competing with investors, the lender or lenders and other bidders just looking to buy a home to live in at a below market price. This part of the market requires a substantial investment in time and expertise. You will not have a chance to see the house. Bring cash to buy these homes sold “as is”. These sales are often substantially below market but often require substantial improvements or repairs. I witnessed an actual auction recently. It lasted about twenty seconds. This method is not for the indecisive or faint hearted. Foreclosure property sales occur in every state. Each state’s foreclosure statistics are different and, each state has rules about how the foreclosure process works. 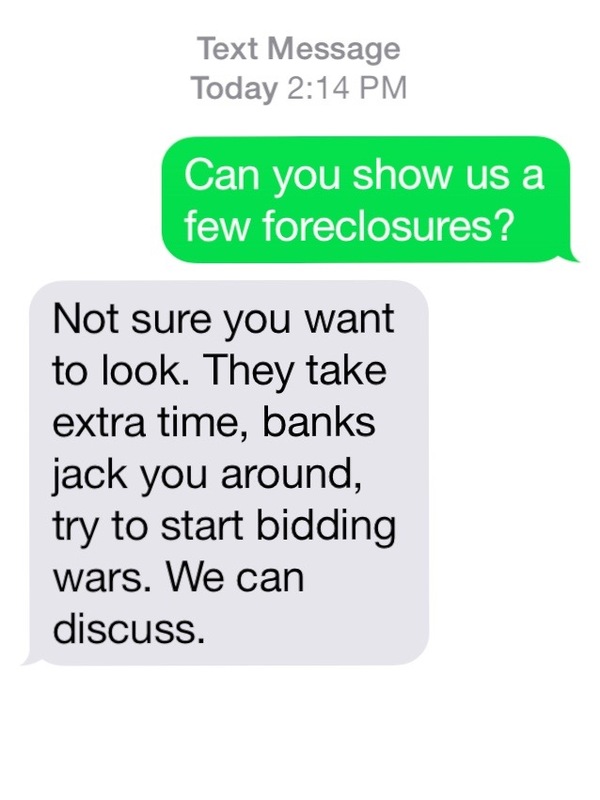 So depending the state, foreclosures in the market have varying effects. According to the Case-Shiller Index, more than 40 percent of home sales in Georgia this year were foreclosure sales, so understanding how to buy foreclosures makes sense. In a state like Vermont, I suspect it may be hard to find a foreclosure. The impact of learning how to deal with foreclosures varies from state to state. I get anecdotal evidence from readers around the country that the market is improving. The supply of foreclosure homes is shrinking, and the reluctant home sellers waiting for the market to change are reappearing. 1. They discourage buyers from participating. They realize the work is harder, and there is a learning curve with new software, procedures and success rates. They choose not to subject themselves or their customers to it. 2. They participate, reluctantly. If they have a customer that identifies a foreclosure type property, they will go through the steps. They cannot wait for the days when things will be back to normal. 3. They have embraced the new procedures and mastered the steps to take. They have made new contacts in working through the problems they can go to on the next transaction. They have figured out which lenders are most cooperative and which ones are not. They are making the best of a bad situation. There is a fourth category of agent. This is the agent that works the auction market exclusively. The agents in the first three categories do not. This agent is a seasoned veteran who understands all the submarkets exceedingly well. This agent most likely has also invested himself or herself. They work the market entirely differently than the bulk of the agent population. They find qualified risk takers, mostly investors or groups of investors who bid at the auctions with cash. This buyer has also studied the rules and knows there is no opportunity to inspect the homes. This buyer also is willing to buy property “as is”. The agent studies a list of upcoming properties to be auctioned, drives by the properties and provides a list to the qualified prospects that signed up for it. On the day of the auction, the bidders call the broker and submit an oral bid (followed by an email confirmation) or a bid range. Working with a third party bidder, who attends the auction and submits the bids, the agent bids on and buys property for his customers. This takes a considerable amount of skill and dexterity. I see the job as similar to that of a floor trader on the Chicago commodities exchange. This is how one would most likely participate in the actual auction. Bridgette, I hope this information helpful. If you have any questions, please ask me.